By signing up to this webinar you agree to be contacted (by email) by the hosts Euromoney & Global Capital, as well as the sponsor Standard Chartered. The London Metal Exchange (LME) and Euromoney Learning have launched a brand new webinar series to offer you a free taster on some of the themes and topics covered in our introductory courses run globally throughout the year. To kick off the series, we’ll be looking at the fundamentals of hedging your metals price risk on the LME. Emma Jenkins, who has been teaching LME introductory courses since 2015, will introduce the concept of hedging, how it works in principle, and then working through an example of how you can use LME futures contracts to hedge. She’ll also be able to answer any questions you might have. As another year begins, there are risks to the global economy around every turn. The on-off trade war between the US and China is weakening sentiment, protracted Brexit negotiations are fuelling uncertainty, and rising rates in the US are sending emerging market currencies spiralling. Are we on the cusp of a major slowdown in global growth, or on the brink of positive disruption? David Mann, Standard Chartered’s global chief economist, tells Euromoney he is optimistic. •How long will the easing of trade tensions between the US and China last? Will the trade war start again soon? •Are trade tensions damaging global growth? •How much is Brexit impacting confidence in the UK and eurozone economies? •Are changing demographics the biggest long-term threat for developed economies? •Which economies will out-perform in 2019? Register now to join David Mann in conversation with Matthew Thomas and hear some answers that may surprise you. How bad are things now? - To what extent are the barriers that have already been erected by the United States and China damaging trade between the two countries? - What is the likely impact on GDP? - Is the trade war already hurting other economies? - In the long-run, can either China or the US expect to gain economically from a trade war? Or is it a lose-lose proposition for both economies? - What about the longer-term impact on other economies, especially those in Asia? Which countries will lose the most from the trade war? Will countries stand to benefit? - What policies do the China and the US need to put in place to minimise the impact on their domestic markets? How much has China’s move towards a consumption-led economy softened the blow? - How much further will the trade war escalate? Are there areas of potential cooperation where the two sides could come closer together? - Could non-trade barriers be a future step? - How should other countries, particular in emerging Asia, prepare for a prolonged trade war? Just the beginning: How much room is there for disruption in securities services? Securities services and post-trade settlement should be ripe for disruption, but there are high barriers to entry for fintech start-ups. How much room is there for disruption in the post-trade lifecycle? Where will innovation come from? What are the best examples in securities services? More than cryptos: What is the role of blockchain in securities services? Blockchain is a secure and efficient ledger technology – but it is too often identified entirely with the boom and bust of cryptocurrencies. What role can blockchain play in the securities services business? What specific advantages can blockchain offer in the securities services business? Can private blockchains offer the same advantages as public chains to banks and their customers? Are there risks with this approach? Embracing change: How can firms pull off the cultural shift? It is now commonplace for banks, funds and other firms to talk about the importance of innovation and disruption, but to what extent does innovation remain a sideshow for the real decision makers? Do many employees still fear disruption? Should they? How can firms pull off the cultural shift needed to ensure that everyone — from the bottom to the top of an organisation — embraces innovation? •What are the latest developments on China market access since the launch of Bond Connect? •How has market sentiment towards China evolved with broadening access? •Fifteen years after QFII launch, why did the Stock Connect and Bond Connect manage to trigger such enthusiasm among global investors? •How are investors moving from understanding China access to their first allocations? What have been the challenges? How significant is the knowledge gap still? •How will HKEX continue to build on the Mutual Market Access strategy? •MSCI opened the way with A-shares inclusion, but what will the prospects for further index inclusions mean for RMB assets’ appeal? What access issues remain unaddressed? •What further reforms are needed to encourage foreign investors to increase allocations to the mainland market? What asset classes remain on the wish list? 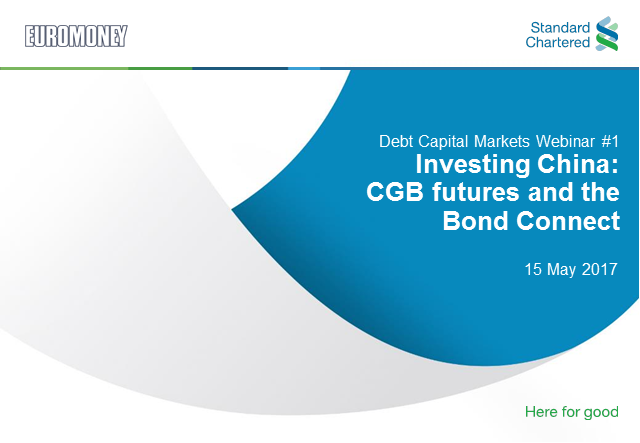 How does Bond Connect compare to previous schemes targeted towards foreign investors, including QFII/RQFII and CIBM Direct? What are the advantages it offers over those programmes? What are the hurdles still remaining for investors using the Bond Connect scheme? European Ucits funds remain locked out of the market because of delivery-versus-payment issues -- are there other problems investors need to see addressed? Is the Hong Kong-China Bond Connect only the first step in a wider series of reforms? How much impact could London-China Bond Connect have on foreign fund flows into China's bond market? How important is China's inclusion in global bond indices going to be for driving demand from offshore investors? How much has that impacted demand already? What reforms do Chinese regulators need to make to ensure a more widespread inclusion in the global indices? Do you see these happening anytime soon? What opportunities do wholly-owned foreign enterprises (WFOEs) offer to foreign investors? Are these increasingly going to become the best way to bridge the gap between the onshore and offshore bond markets? Finally, when will foreign investors start to buy a broader range of credits in China's onshore bond market? Will China soon become a credit play rather than just a rates play? -How stressed is the corporate sector? By signing up to this webinar you agree to be updated by Euromoney, GlobalCapital & Standard Chartered. Technology advancements have changed the way financial services operate, but they have also ushered in new challenges and threats. What are the risks, how big are they and what is the impact? Eg. Data theft versus system shut downs – which has a greater economic threat? Cyber criminals have exposed vulnerabilities of financial institutions to disturbing effect. Is it more effective for banks to counter cyber risks on their own, or collectively as an industry? Would it help to have a central regulator for bank cyber security? When assessing counterparty risks, how much weightage is placed on their cyber security controls? How much closer are we to creating ‘unhackable’ systems? Can quantum computing or other technologies present a cost-efficient solution? - How stressed is FY18 fiscal health amidst farm loan waivers, salary revisions, interest burden and GST? - SDL yields: Disconnected with fundamentals. Why? - Is the INR overvalued? * What are the missing pieces —the role of regulation, what reforms are needed? Standard Chartered Bank will be sponsoring a series of Euromoney webinars on debt capital markets & securities services tackling the latest industry challenges. Sign up below.